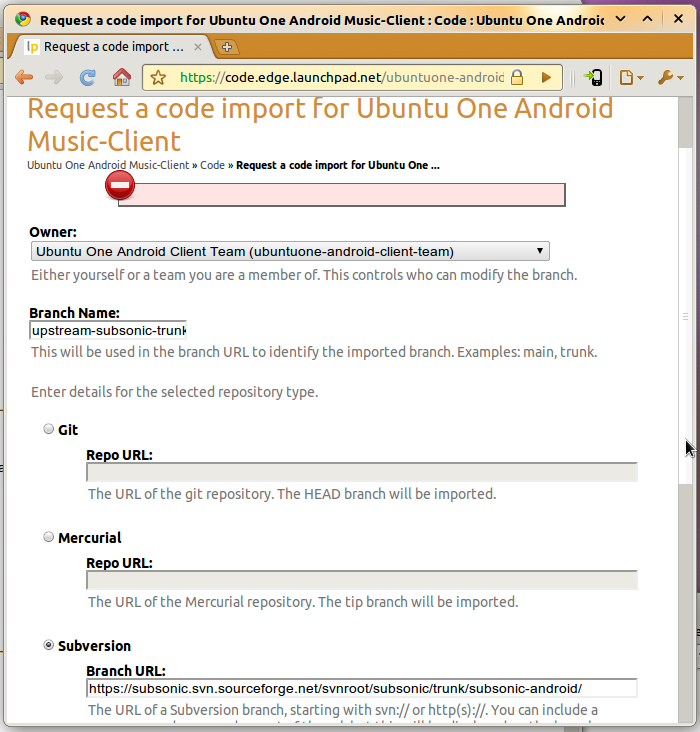 In project "ubuntuone-android-music", I wish to import the upstream trunk, https://subsonic.svn.sourceforge.net/svnroot/subsonic/trunk/subsonic-android/ , as a branch. I set ubuntuone-android-client-team as the new owner (a team of which I am a member), and set the branch name to "upstream-subsonic-trunk". When i hit "Request Import", I'm returned to the form, with a blank error message at the top. The underlying cause may be something related to the branch ownership. If I change the owner to my personal account, it succeeds. Empty error message is still wrong, but if I choose team "ubuntuone-hackers", the same owner as branch "trunk", as owner of the requested import, it also succeeds.